This video outlines the steps the ATO will take if it wants to make you bankrupt. Hi, it’s Catriona, from Hartigan Law. In this video, I want to talk about the steps that the Tax Office will take if it wants to make you bankrupt. There are quite a few steps, so stick with me. If you ignore that letter, or if you can’t arrange a payment plan with the Tax Office that’s acceptable, then they can escalate it to the next step. That next step is to issue you with a summons or a writ in relation to your debt. The exact title of that document will depend on what state you’re in. There’s a different process in each state. But, really, the idea behind this document is, it’s the first step in a court process to get a judgment against you. So when you get that document, quite often, it’ll tell you what you could do if you wanted to defend the debt. But remember that these are standard court documents. Whilst they might tell you what you could do to defend the debt, often, that doesn’t really apply to tax debts, and that’s because of something called the ‘conclusive evidence rule’. Which essentially says, if the Tax Office says you owe the money, then you owe the money. And in reality, there’s very few defences to a tax debt. So, quite often, once you’ve got a summons or writ, your only way out of it is to actually pay the debt, or get into a payment plan with the Tax Office. So, let’s assume you haven’t done one of those things. The next step that the Tax Office will take is to obtain a judgment against you. Because of the conclusive evidence rule, this is very much a rubber stamping process for most tax debts. The Tax Office will go down to court, tell the judge, “We’ve served this person with a summons, or a writ,” and the judge will say, “Okay. We agree that this person owes you the money.” So then the Tax Office has a judgment against you. The next step that the Tax Office can take, after getting in a judgment against you, is Step Four on these slides. And that is to serve you with a Bankruptcy Notice. Now, the Tax Office can do this any time within six years after getting a judgment against you. So it has a really long time. But what that also means is that, even if there’s a judgment against you, you still have time to negotiate with the Tax Office to pay your debt. If you get a Bankruptcy Notice, it will say, you have 21 days to either pay your debt, or enter into a payment arrangement for that debt. If you don’t do one of these two things, then you have committed an “act of bankruptcy”. And that’s a term that’s defined in the legislation. Once you’re at this process, the court has very little room to move. The act of bankruptcy allows the court, or tells the court, to presume that you are bankrupt, and you do need to work very, very hard, to prove that you’re not bankrupt. So, once you’re at this point, it is really quite difficult to avoid bankruptcy. You still have the option of negotiating with the Tax Office about a payment plan, but generally, they’re not open as generous terms as they might have been at earlier on in this process. So that’s the last step. The judge could then make the order, which is called a sequestration order, and that’s the final step to make you bankrupt. So, look, no matter where you are in this process, if you’re anywhere between one and five, there is still time to negotiate with the Tax Office. But the earlier you are in this process, the easier it can be to negotiate with the Tax Office. If you do need any help with it, or if you’d like some more information, there’s lots of information on my website, including some stories about how I’ve helped people through this process in the past. Or you can call me on the number at the end of these slides and have a chat about how I can help. How does the ATO collect tax debts? I am a specialist tax disputes lawyer with over a decade of experience in dealing with the ATO. 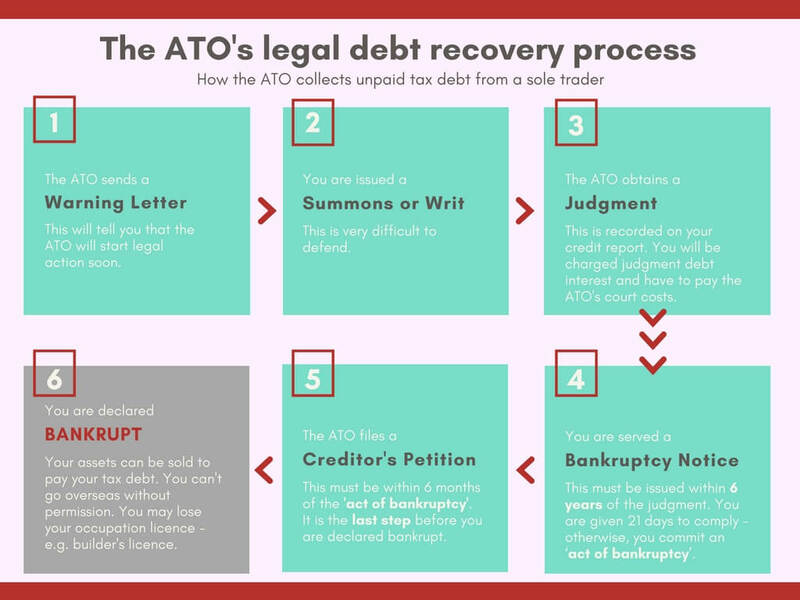 I’ve helped many clients to deal with their tax debt, even after the ATO has started debt collection processes. I have helped clients to avoid bankruptcy by reducing their tax debt and successfully negotiating payment plans with the ATO. I have also helped clients to object to tax assessments and negotiate the withdrawal of improperly issued court summonses. I work with clients all over Australia. I can do this because the tax issues I deal with are Federal – the tax law is the same no matter where in Australia you live. You can contact me on 1300 75 84 84 or at catriona@hartiganlaw.com.au. Liability limited by a scheme approved under Professional Standards Legislation. The content of this website is provided for informational purposes only. It should not be take as legal advice on any issue.